Nationality: American. Born: Paul George Julius von Hernreid in Trieste, Austria (now Italy), 10 January 1908; became U.S. citizen, 1946. Education: Attended Maria Theresianische Akademie, Vienna; Graphische Akademie, Vienna. Family: Married Elizabeth Camilla Julia Gluck, daughter: Monica. Career: 1929—joined book publishers A. G. Strobl, and attended the New Vienna Conservatory Dramatic Academy at night; 1932—film debut in Baroud ; 1933—given contract by Max Reinhardt, and made stage debut in Faust ; 1938—left Vienna after Nazi takeover of Austria; 1939—first British film, Goodbye, Mr. Chips ; 1940—emigrated to America; played in Victoria and Albert in New York; 1941—joined the cast of radio serial Joyce Jordan, Girl Interne ; contract with RKO; 1950s—much work as TV actor and director (he estimated he had directed 300 TV segments or plays); 1962—directed the play Everyman ; 1972—appeared in Don Juan in Hell on stage. Died: Of pneumonia, in Santa Monica, California, 29 March 1992. Ladies Man: An Autobiography , with Julius Fast, New York, 1984. Classic Images (Indiana, Pennsylvania), March and April 1983. Obituary, in New York Times , 3 April 1992. Obituary, in Variety (New York), 6 April 1992. Obituary, in Classic Images (Muscatine), May 1992.
grace. He played that type of role in two Hollywood classics which are so solidly etched in the minds of film enthusiasts that the remainder of this actor's full screen career dims against their bright lights. The first of these films, Now, Voyager , probably would have been remembered mainly as a tear-filled Bette Davis vehicle, in which the actress plays Charlotte Vance, a dowdy old maid headed for a nervous breakdown as the film begins. But Henreid, as Jerry Durrance, the unattainable love of Charlotte's life, created an indelible image when, in a recurring motif, he lit two cigarettes simultaneously and then handed one to Davis, one of the great romantic gestures in silver screen history. A few months later Casablanca was released. In it he plays Victor Laszlo, archetypal freedom-fighting Resistance leader/political refugee whose brave efforts against Nazi tyranny, and the subsequent tortures he suffered during a year in a German concentration camp, have left him just a couple steps below sainthood. 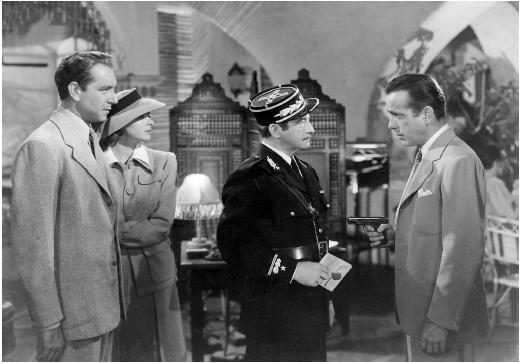 His finest moment, in a film made up of memorable moments, is the scene at Rick's Place in which he leads French citizens, demoralized under Nazi occupation, in a stirring rendition of the Marseillaise, drowning out the voices of German soldiers raised in a Nazi war song. While Henreid's characters never flirted or gave a heavy come-on toward female co-stars, the actor exuded an air of romance which most women—on-screen and in the audience—could not resist. Even when he vied for the woman he loved with actors who had more zip and flash (Bogart in Casablanca , Claude Rains in Deception ), his reserved elegance won out. As the powers at Warner Brothers came to recognize the appeal of their continental gentleman, they took a giant step in imaginative casting by starring him in the swashbuckler adventure The Spanish Main , in which he plays a bold pirate who rescues Maureen O'Hara from the villainous Walter Slezak. In the Technicolor entertainment Last of the Buccaneers , he plays dashing Jean Lafitte most effectively, and he went on to star in a string of swashbucklers in the 1950s. Henreid's career dates to 1933, when he was discovered in Vienna by Otto Preminger. Shortly after that, he was given prominent stage roles in Max Reinhardt's Viennese theater. In addition to honing his acting craft, he learned enough about directing from Reinhardt and later from an array of Warner Brothers's filmmakers to begin directing in the 1950s. He pursued directing motion pictures, television shows (mainly for Alfred Hitchcock), and subsequently, television films until his death in 1992. Henreid's autobiography Ladies Man appeared in 1984. In it he discussed aspects of his life practically unknown to many, including his prestigious acting career in Europe, his own real-life flight from the Nazis, his liberal politics, and the infamous blacklisting period in Hollywood which he claimed had a detrimental effect on his movie career.